Constantin Brâncuși was without doubt one of the most influential sculptors of the 20th-century. A few of his creations contain this motif of ascension, represented by aerial symbols, as well as the concept of infinity. L’Oiseau dans l’espace (Bird in Space) represents a series of sculptures in which Brâncuși concentrated on the harmonious movement of the bird, instead of the physical attributes. The artist’s spiritual aspirations, his need for transcendence of the material world and its limitations, are verbalized in his description of the sculpture as a project before being enlarged to fill the vault of the sky. Just by gazing at the delicate yet dynamic shape of the bird, we are immersed into the mind of Brâncuși and are able to learn about his interior conflict. The elimination of the wings and the feathers suggest the escape from the human body (representing the material world) and the remaining shape symbolizes the soul trying to free itself. The way he conveyed this profound message – through such a simple sculpture – is one of the reasons why Constantin Brâncuși is considered the patriarch of modern sculpture. Personally, I admire works of art that communicate a whole lot more than what they appear to be, so Bird in space is a creation I think highly of because of this reason. 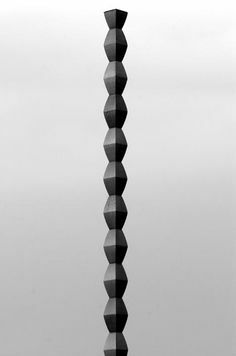 Praised as one of the greatest works of 20th century sculpture, The Infinity Column by Constantin Brâncuși was commissioned by the National League of Gorj Women to honor the soldiers who defended Târgu-Jiu against a German force during World War I. The meaning behind the sculpture refers to the concept of infinity and the infinite sacrifice of the Romanian soldiers. It is considered by Sydnei Geist as the top of the modern art. Also, Geist’s construction of Brâncuși included the sculptor among the important artists of modern art. The motif of ascension is approached through the vertical orientation of the column, whose repetitive and identical elements create the illusion of infinity. It is considered that the idea of endlessness is expressed through the incomplete top unit. The sculpture could be thought of as one of the most inspiring works regarding this concept, especially because of its simplicity. Ascension is also a widely used notion, probably because humans are the kind of beings that wouldn’t settle for what they already have, they feel the need to evolve constantly, which is why artists often use the motif of ascension in their artworks. Unfortunately, the need to evolve doesn’t refer to the spirit most of the time, but to money and status. In this superficial rush, we forget what we should really focus on, and I believe that the true artist will always be there to remind us through their art to take care of our soul and to evade from this material world from time to time.